Copy a Chinese Landscape painting or a section of a painting to analyse the formal elements of a Chinese painting: line quality/ brush strokes, texture strokes, classical composition, ancient ideas on perspective peculiar to Chinese painting, monochrome or limited color palette, format for painting rocks, mountains,trees, water, mist, empty spaces. On completion of the copy study create a Chinese landscape of your own composition. Explore modern techniques or ideas that you could combine into your Landscape that would compatible with the formal aspects of a Chinese painting. 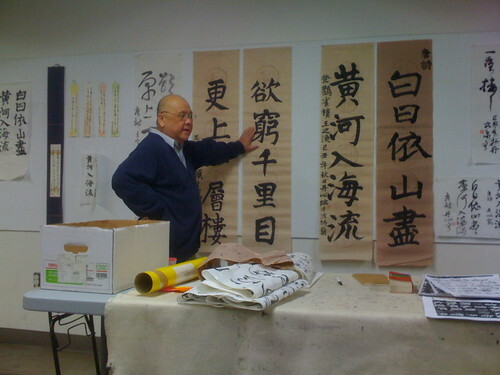 Terry Louie/Lei Danxin is accomplished in the five classical scripts of Chinese calligraphy, Qin and Han dynasty seal engraving and traditional scholar painting. His work has a foundation in the study of epigraphy and scholar ink painting. He studied painting with the Hebei scholar master Sun Yuqin (1915-1990) and studied calligraphy and seal engraving with master Jiang Xinheng (b. 1928).